Every summer, Hongkongers do their best to escape the suffocating air of the city. One popular local destination is Cheung Sha beach – a strip known for its bayside restaurants and clear (by HK standards) water. The spot’s latest offering, Long Island, is an airy space which opens up on to the beach where diners can lounge on plastic chairs and firmly dig their toes into the sand – a sign you’re truly away from the city. The cuisine on offer is a hodgepodge and we dive in with a portion of pan-fried dumplings ($95), which come highly recommended. With hearty fillings enveloped by thin pastry, these plump morsels are served with a tangy sauce that adds just the right amount of acidity to the dish. 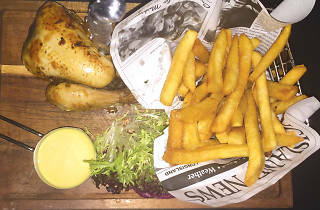 Next, we opt for the Long Island spring roast chicken ($158). Served whole and marinated in a fiery piri piri sauce, the chicken is perfectly cooked. 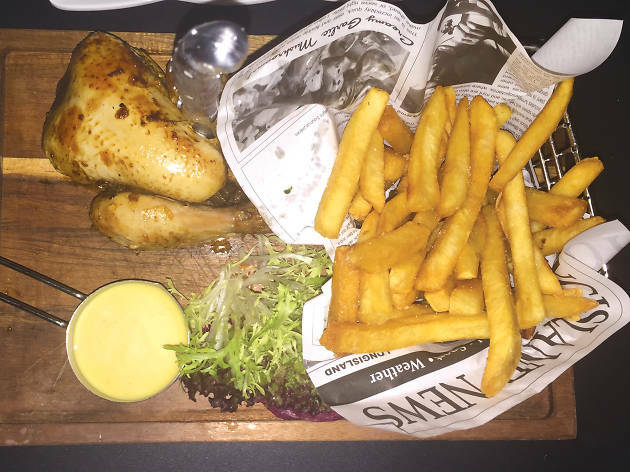 A side salad and chunky chips fill the wooden serving board, making this quite the substantial portion. To conclude the meal, we order the pear tart ($60). While more fruit in the tart would help cut through the custard, the pastry is crisp and the berry coulis is tart enough to balance the plate. The food isn’t bad at Long Island but there’s nothing outstanding except for the restaurant’s charm. Even that lacks the atmosphere of nearby Beach House, which has a solid theme serving craft beer. Long Island needs to find its niche to become a destination on Cheung Sha Beach.